US, 1940, 110 minutes, Black and white. Raymond Massey, Gene Lockhart, Ruth Gordon. Abe Lincoln in Illinois is an excellent piece of Americana. Always popular in literature and history, Lincoln was the subject of a film by John Ford in 1939, Young Mr. Lincoln with Henry Fonda in the title role. 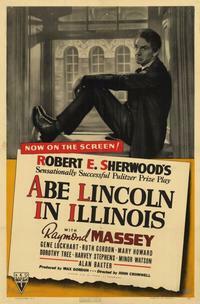 Pulitzer Prize-winner Robert Sherwood wrote Abe Lincoln in Illinois and adapted his prize -winning play for the screen in 1940. The popularity of Lincoln on the screen at the time helped the film to be a success and it received many Oscar nominations. It was also an excellent piece of propaganda for the state of the world and war in the early 40s. Veteran John Cromwell directed the film with taste - there are, how ever, a few over-reverential sequences in the film. But the strength of the film lies in Raymond Massey's warm, homespun and excellent performance. Whether he is portraying Lincoln as a simple man in the backwoods or making very strong political speeches, he is entirely persuasive. In fact, Canadian-born Massey was so good as Lincoln that he resumed the role in 1955 portrait of Shakespearian player Edwin Booth (whose brother John Booth assassinated Lincoln) in Prince of Players and also as a guest role in How The West Was Won in 1962. Henry Fonda, Dennis Weaver (The Great Man's Whiskers) and Gregory Peck (The Blue and the Gray) have portrayed Lincoln. Of cinema interest, playwright-actress Ruth Gordon appears as Mary Todd. Ruth Gordon is an offbeat actress, her appearance, style of speaking etc. She makes the role of Mary Todd interestingly brittle. With her husband Garson Kanin, she wrote many plays and screenplays and reappeared on screens in the '60s in Inside Daisy Clover and her Oscar winning Rosemary's Baby. She made more appearances on screen in the '70s and '80s than in her previous very long career. 1. The film considered as a classic? Classic play? Prize-winning? 2. The focus on Lincoln and his importance, popularity? A film of 1940? The portrait of Lincoln by Raymond Massey? 3. Production values: black and white photography, the atmosphere of the period? Robert Sherwood's work, his playwriting, adaptations for the screen? The opening out of the play? Creditably and credibly? The Lincoln speeches? 4. The importance of audience attitude towards Lincoln? Knowledge of his life, career, the Civil War, civil rights, assassination? 5. Lincoln in the backwoods: the sketch of his family, the respect for the Bible. his reading Shakespeare. his father's ignorance of it, his mother hoping he would write poetry? The taking of the pigs to New Orleans? Going downriver. the accident with the pigs? 6. Lincoln's travel and experience, opening up the store. giving customers credit, his homespun philosophy and humour, storytelling, goodwill for his customers? The old man warning him not to go into politics? The men coming to invite him to stand as candidate? His reliance on the biblical advice, given by his mother, of doing God's will? 7. The encounter with Anne Rutledge, attracted towards her, a pleasant young girl in the town, coming to get the mail, the disappointing letter, her grief, Lincoln's proposal to her, her hesitation, the dance and her faster dancing and collapse. her illness and Lincoln's coming to her, her death? The emotional effect on Lincoln? 8. The background of elections, electioneering, tough campaigners, the forcing of people to vote for Lincoln? The formation of his stances and political and social views? 9. The background of his friend the judge, his stances? The law career, Lincoln giving up politics and working on law? The continued with the judge? Leading to the campaigns? The two speeches? The formulation of different views on slavery and the United States? 10. The introduction to Mary Todd, her family, her snobbish sister? Her setting her cap at Lincoln? Listening to his stories? Avoiding the judge? Her plan for the proposal? Lincoln's doubts and his not marrying? His going back to his roots? Trying to discern God's will? His return to Mary and her forgiving him? The years together? The children growing up? Her severity of manner - smoke in the household, the scene of the photograph and Lincoln tickling the younger boy? Severe with her children? Her pushing Lincoln? Her ambitions and dreams, her having to give them up when he first refused her her making her life for Lincoln? The kitchen scene and the premonition of death? The reaction to the news about the presidency? The tension on the election night, Lincoln losing his temper with her and her edginess, her feeling the night was ruined, her going home? An interesting portrait of marital love and tension? The sketch of the children and Lincoln's relationship to them? 11. Billy and his friendship for Lincoln, pushing him - in the same way as Mary Todd? His drinking Mary Todd's health and hoping she would bring the best out of Lincoln? His continued presence, comments, drinking? 12. The background of judges, politicians? The east coast campaigners and their being impressed with Lincoln? The campaigns? 13. The portrait of Lincoln in himself, an American, a man of the backwoods, homespun experience, the love of the Bible, simplicity, a loving man, a man of peace (his experience of the Indian wars - being scared as were the Indians), others urging him and his diffidence, not wanting to stand out, his experience of the law, being pushed by Billy, falling in love with Anne Rutledge, his gentleness towards her. falling in love with Mary. his hesitation and the anguish and writing the letter, his friends urging him to tell her, his revisiting his past and knowing that he had a destiny, the vision of his mother and her word of God, entering into politics, his strong stance on issues - admiration for the antislavery, (the sketch of John Brown and his dying son,, his arrest and hanging), his respect for the founding fathers and understanding of freedom, the law, blacks? The important content of his speeches? The election - and his entertaining of the east coast campaigners? Mary's attitude on the night? His really not wanting to win - the bodyguard coming and his knowing that he was not his own man, Billy's warning about the responsibility for the Civil War? His final speech, his whiskers ? and the train departing? 14. The film showing Lincoln as Honest Abe, a good man, a politician (a natural politician rather than contrived)? An important American figure? 15. Issues of the United States, freedom, slavery, democracy, rebellion? The United States being a power for good rather than a terror? The significance of the film and its impact in 1940?